I was always a big fan of the Warner Brothers cartoon Animaniacs. I’ll admit I’m a nerd and had bought some Pinky and the Brain items knowing at some point I would have children. When my oldest child was first born he carried around a stuffed Pinky doll (although I prefer ‘action figure’) everywhere he went. One time we left it at the doctor’s office and I thought for sure we were sunk because it wasn’t an item that could be easily replaced. The Animaniacs marketing machine had long since shut down. Fortunately, it was still there when we went back later in the day. When child number two came around, we didn’t give much thought to Animaniacs. We had moved on to the Disney phase (Pooh, Mickey, Goofy). But when the third child arrived, we had discovered built-in nicknames! The first two kids are boys, and the youngest is a girl. 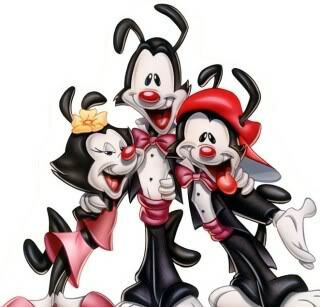 It just so happens that it was a perfect match to Yakko, Wakko and Dot. My oldest is Yakko and fittingly, he talks A LOT. He also has a lot of big ideas that tend to get his younger sibs in trouble more than him. Our youngest son is definately Wakko. He’s a bit silly and does things his own way, unless he’s following Yakko’s lead. And then there is our youngest, Dot. She’s the cute one. And she knows it. When I first started this blog, Yakko was in fourth grade, Wakko second grade, and Dot was a precocious four year-old. Now Dot is the fourth grader, Wakko is in middle school (although when I was a kid, it was called Junior High) and Yakko is in high school (and learning to drive). They do all of the things you would expect siblings to do. They play, they fight, they yell, they hug, they argue and they love each other very much.